With much humour and an undercurrent of pathos, Quartermaine’s Terms looks at the lives and relationships of seven teachers who gravitate between classes to the faculty common room of their small British school for foreigners. Quartermaine’s Terms was named by the Royal National Theatre as one of the best 100 plays of the 20th century. Quartermaine’s Terms played at the Wyndham’s Theatre, London, from 23rd January 2013, after short runs at the theatre Royal, Brighton, and the Theatre Royal, Bath. Visit the Quartermaine’s Terms website to book tickets and find out more. 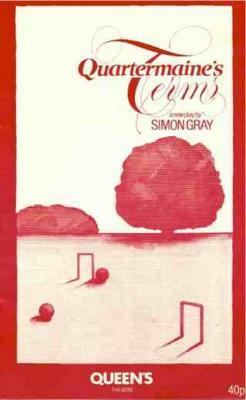 Read an interview with Simon Gray about Quartermaine’s Terms and his career from America’s Arena magazine, given at the time of the 1984 production of Quartermaine’s Terms at the Arena Stage, Washington D.C.
A BBC TV production of Quartermaine’s Terms starring Edward Fox and John Gielgud was broadcast in 1987. A copy of it can be viewed on the youtube channel embedded to the right of this page. A radio play of Quartermaine’s Terms was broadcast on BBC Radio 4 in 2006, starring Michael Palin as St.John Quartermaine. Quartermaine’s Terms is available in the collection Simon Gray: Plays 3 (ISBN 978-0571254880) single volume edition published by Faber and Faber. To order a copy on special offer at 25% discount visit the Faber website and use the code GRAYPLAYS. Or check out the plays section of our bookshop. Quartermaine’s Terms is also as a single volume edition published by Faber and Faber on 07/02/2013. To order a copy visit the Faber website. For UK and Worldwide professional rights please contact Judy Daish Associates at rozzy@judydaish.com. For amateur rights please contact Samuel French at www.samuelfrench-london.co.uk.